Aren't we thrilled and elated when we are classified in the HNI (High Nett worth Individual) category? In simple terms nett worth is the value by which Assets exceed Liabilities at any given point of time; as is commonly reflected in the Balance Sheet. Nothing wrong in striving to earn enough to live in reasonable comfort, look after educational expenses of our children, provide for medical contingencies and ensure a decent retired life. But who is to define reasonable and decent – HOW MUCH IS ENOUGH? And that's the question which has been at the root of the movement against corruption initiated by ANNA HAZARE and BABA RAMDEV which has been in the news last quarter. Yet surprisingly no one seems to have contemplated on one's TRUE nett worth – and everyone has been focused only on the TRANSITORY nett worth – i.e. the one which can be claimed only during one's physical life time. But WHAT ABOUT YOUR BALANCE SHEET IN THE AFTER LIFE? Have we made enough efforts to ensure a high Nett Worth Balance for our after life? High time you thought about it. Our community is known to be spiritually inclined; Sufism and Guru Nanak's teachings have always played a substantial role in our lives and I take this opportunity to make a 'Reminder Call' to those who may have momentarily strayed off the righteous path. 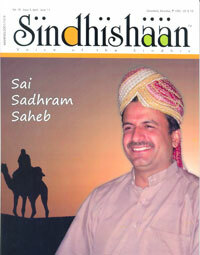 In that vein Sindhishaan carries in this issue an interview of Sai Sadhram Saheb, the Head of the Holy pilgrimage Sai Satramdas Dham at Raherki Saheb, Sindh, Pakistan, by Ram Jawhrani. Incidentally, Global Sindhis – by Ram Jawhrani has created a record of sorts – 3,000 copies of the first edition have been sold till date and preparations are on for the second edition. A great hit amongst Sindhis all over the world featuring towering personalities from Sindh and conveying their contribution to the freedom struggle, the travails and trauma of Partition and their struggles and ultimate success story. I wonder if any other contemporary book on Sindhis has sold as many copies and that too with a price tag of ` 1,000/-. Let us try to emulate the spirit and moral fibre of these personalities depicted in the book to improve our own personal lives.